Are glaciers growing or retreating? Most glaciers are retreating, posing a serious problem for millions who rely on glaciers for water. Although Glaciologists measure year-to-year changes in glacier activity, it is the long term changes which provide the basis for statements such as "Global Glacier Recession Continues". Some Skeptics confuse these issues by cherry picking individual glaciers or by ignoring long term trends. Diversions such as these do not address the most important question of what is the real state of glaciers globally? The answer is not only clear but it is definitive and based on the scientific literature. Globally glaciers are losing ice at an extensive rate (Figure 1). There are still situations in which glaciers gain or lose ice more than typical for one region or another but the long term trends are all the same, and about 90% of glaciers are shrinking worldwide (Figure 2). Figure 1: Long-term changes in glacier volume adapted from Cogley 2009. It is also very important to understand that glacier changes are not only dictated by air temperature changes but also by precipitation. Therefore, there are scenarios in which warming can lead to increases in precipitation (and thus glacier ice accumulation) such as displayed in part of southwestern Norway during the 1990s (Nesje et al 2008). The bottom line is that glacier variations can be dependent on localized conditions but that these variations are superimposed on a clear and evident long term global reduction in glacier volume which has accelerated rapidly since the 1970s. "the seven glaciers on Shasta, part of the Cascade mountains in northern California, seem to be benefiting from the warming ocean"
Can the list of increasing glaciers be subdivided, by explanations, in a meaningful way? The increased snowfall in central Greenland and Antarctica is due to the increased evaporation from the warmer polar seas around them. Could this same reason apply to western Norway (Briksdal Glacier) and the west coast of South New Zealand (Franz Josef Glacier, Fox Glacier)? "But Salinger said New Zealand glaciers were boosted by extremely high rainfall, with more than 10m a year falling west of the Southern Alps' main divide. Iam making my argument despite the following article...which goes into greater detail. "Norway and New Zealand both experienced recent advances, commencing in the early 1980's and ceasing around 2000, which were more extensive than any other since the end of the Little Ice Age. Common to both countries, the positive glacier balances are associated with an increase in the strength of westerly atmospheric circulation which brought increased precipitation..."
The Karakorum Mountains are mentioned above. "...Hubbard Glacier is the largest of eight calving glaciers in Alaska that are currently increasing in total mass and advancing. All of these glaciers calve into the sea, are at the heads of long fiords, have undergone retreats during the last 1,000 years, calve over relatively shallow submarine moraines, and have unusually small ablation areas compared to their accumulation areas." Icy Bay is located near the Hubbard Glacier, on the Gulf of Alaska. Note that all eleven of these increasing glaciers are located on the coast. I couldn't find an Alaskan map locating its glaciers. But Google Earth suggests that the largest glaciers are on the coast, and behind it; in an arc around the Gulf of Alaska. Winter Land and Ocean Surface Temperature trend maps seem to indicate cooler water near the Gulf of Alaska, but warmer water way out in the north Pacific. NOAA Wind Direction vectors for January pass thru the warm Pacific area, and head toward this coast. Could the increasing Alaskan glaciers be attributed to Global Warming via the warmer waters in the north Pacific? Mount Shasta is mentioned above. The Mount Shasta explanation would also cover two small glaciers nearby in the Trinity Alps. "Since 1980, there has been an advance of more than 55% of the 625 mountain glaciers under observation by the World Glacier Monitoring Group in Zurich..."
A skepticalscience listing on this page, it is from a 2007-12-23 dated website. Obviously, '1980' seems pretty irrelevant. And,from the table above, 7% are increasing. "Crater Glacier" is inside the Mount St. Helens crater. "Shadowed by the crater walls and fed by heavy snowfall and repeated snow avalanches, it grew rapidly..."
This sounds like a special case, to me...a 'shadow' glacier. "In addition, since 2004, new glaciers have formed on the crater wall above Crater Glacier, feeding rock and ice onto its surface below." "Very high-elevation Mont Blanc glaciated areas not affected by the 20th century climate change..."
"...the mass balance of the glaciers is strongly controlled by precipitation, not temperature." This list is from a skeptic website that, among many other things, lists articles about 'GROWING' glaciers. I have not included the more recent, post La Nina, situations. My focus above was on increasing glaciers that were referred to by skeptics. I got them from an endless skeptic bibliography...that's split up into a hundred subdivisions. GW skepticism being what it is, the counter argument was often also there, in the same article. In addition, there'd be some "google words", on which to continue. The other skeptic source I know about is also subdivided; and includes some text, with a literature review. A neophyte believer blogger's first source would likely be a skeptical argument website, like skeptical science.com. Is appinsys the first source for a neophyte skeptic blogger? There's no hope for the cynical skeptic, who'll cherrypick anything anywhere. And the gullible skeptic can probably be reached only on his own entry level conspiracies. But I think the more open-minded ('skeptical') skeptic would eventually see through this disjointed collection of counter arguments...that don't add up to a realistic whole. Are there any other useful skeptic sources? Almost 90 percent of Austrian glaciers shrank in 2009, some by as much as 46 metres (150 feet), the Austrian Alpine Association (OeAV) said Friday. In a report, the OeAV said 85 out of 96 glaciers had shrunk over the past year. The biggest changes were seen in the Oetz valley in western Tyrol province, where three glaciers retreated by over 40 metres, and eight by over 20 metres. "The ice is very thin over large areas, so the glaciers are retreating very quickly," noted Andrea Fischer of the University of Innsbruck, who conducted the measurements for the alpine club. One glacier bucked the trend and expanded, but only by a few dozen centimetres. Temperatures were higher than average by about 0.2 degrees Celsius in the winter of 2008-2009 and by 2.1 degrees last summer, the OeAV noted. I have seen this graph you posted abopve, but the data you reference cuts off in 2006. I have seen researching the web that the Western Himilyas, Argentine Mountains and most of N America Glaciers have shown growth and stopped what amounts to a 250 year trend in the last 3-4 years, can you verify? I don't want to trustingly believe everything that I read elsewhere, but your information does not deal with 2007, 2008, 2009 and 2010. The Arctic Ive has certainly recovered in area and thickness since 2007, but it is not talked about? Dave, I've not read of the sort of broad glacier recovery you're speaking of. There are in fact a few glaciers currently in a state of growth thanks apparently to variations in snowfall but the vast majority continue to retreat. Perhaps you could cite where you read of regional increases? As to the Arctic, if you look at the record you'll see many instances where an observer focused on a 2 or 3 year span might think a recovery was beginning, but those little bumps are overwhelmed by a steady downward trend. 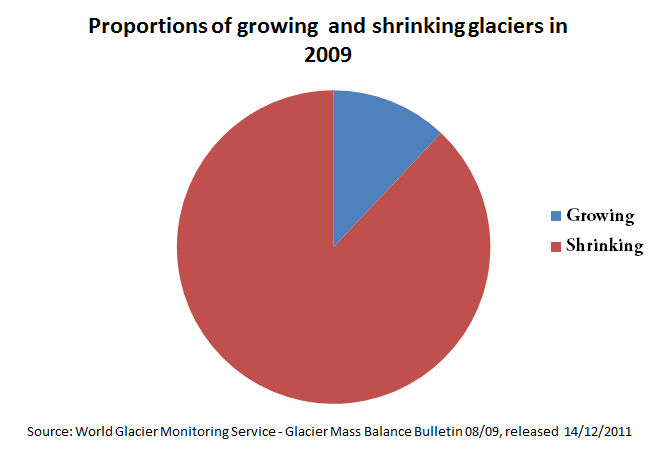 Overall, mass balance of the observed glaciers continues to be negative, but the loss of mass in 2007 and 2008 was less than in 2003 or 2006. I'm not sure what you mean by "The Arctic [Ice] has certainly recovered in area and thickness since 2007, but it is not talked about?" Are you referring to sea ice? The 2008 and 2009 minumum Arctic sea ice extent was above 2007, but still below the long-term downward trend (and far below the levels of the 1980s). I wouldn't call that a "recovery" unless it continues long enough that late-summer sea ice extent actually returns to normal. Dr. Tim Ball was interviewed by Kim Greenhouse on her program on Dec. 10, 2010. He said world glacier ice mass is currently growing, and he talked about the contribution undersea vulcanism is making to oceanic warming. Can you address these issues? rockpicker - As addressed on this topic with multiple papers and lots of data, glaciers are not growing. There's also no indication that the level of undersea volcanism has changed in the last 100 years or so - and geothermal inputs are on the order of ~1% those of greenhouse gas effects. So changes in undersea volcanism isn't driving oceanic warming. Dr. Tim Ball is not what I would call a reliable source - he chairs the Natural Resources Stewardship Project, which is apparently run by energy industry lobbyists, as well as being one of the best known members of the Friends of Science group. He's a well known climate change skeptic with ties to industrial groups. I'll also point out that a show which "...is a broadcast vehicle for introducing new and ancient knowledge, solutions, discoveries, and compelling stories" doesn't sound like a great scientific forum - it sounds like something closer to "Ripleys Believe It Or Not!". rockpicker - "Dr. Tim Ball.....He said world glacier ice mass is currently growing"
Given that the last decade is the warmest in the instrumental record and 2010 the warmest year in that decade, Tim Ball's assertion seemed unlikely from the get-go. Does make you wonder why he would make such an erroneous claim, when it's so easy to check its' veracity. I checked the WGMS and their data is from 100 monitored glaciers. Since there are over 100,000 glaciers world wide this can lead to an entierely new discussion on how or why these were chosen. Trying to figure out the science of climate is still in its infancy and so many things are based on simulations that are based on limited data and potentially flawed assumptions that what impact an additional 100 - 200 ppm of CO2 is doing to the world is truly just a guess for now. When short term climate models(3-5 year) are consistently correct then we can start looking at longer term modeling systems. I don't doubt we need to be better shepards of our planet, but the only way to not impact the planet is to not be on the planet and that is not going to happen (at least any time soon regardles of any zombie movies you may watch). An interesting fiction novel to read is by Michael Chrichton - STATE OF FEAR. He makes many interesting points on the science and politics of Global Warming and Climate Change. While it is fiction, he does add many true facts to the story line. Starnut: Yawn. You're going to trust Crichton but not climate science. Lovely. Don't you think it's odd that someone would write a novel trying to scare people about a project designed to scare people? Where did you get that "over 100,000 glaciers" number, btw? And you don't think that monitoring, say, 10 glaciers in 10 different areas of the world will give us useful data? Or you think that these particular glaciers in the WGMS have been carefully selected by scientists who are in on the hoax? Also, what's a "short-term climate model"? Climate is 30 years, according to climatologists. Finally, speaking of zombies, the science of climate is, by most measures, about 150 years old. The basic radiative physics of CO2 have been established for about that long as well. It's established science. The remaining questions we have are mainly about ocean heating and and cloud effects. Starnut, can you give a reference for the number of glaciers you state ? International glacier monitoring has produced a range of unprecedented data compilations including some 36000 length change observations and roughly 3400 mass balance measurements for approximately 1800 and 230 glaciers, respectively. The observation series are drawn from around the globe; however, there is a strong bias towards the Northern Hemisphere and Europe. A first attempt to compile a world glacier inventory was made in the 1970s based mainly on aerial photographs and maps. It has resulted to date in a detailed inventory of more than 100000 glaciers covering an area of about 240000 km2 and in preliminary estimates, for the remaining ice cover of some 445000 km2 for the second half of the 20th century. This inventory task continues through the present day, based mainly on satellite images. @Starnut, I suggest you read less airport literature and more actual science in order to form a valid opinion on climate science. Anyone left clinging to the glacier growing myth? Explain the emergence of ice mummies. Glaciers hold only 1% of the planet’s ice. Antarctica and Greenland hold the rest, with the greatest amount in glaciers being in the Himalayas. I don't know how Cogley weighed his data. That the vast majority of glacial volume is in the Himalayas and that soot is causing more melting there than warming (http://esciencenews.com/articles/2011/03/03/soot.packs.a.punch.tibetan.plateaus.climate) provides additional pause. So, a chart of a sampling of ice loss from glaciers world wide says very little about what to expect from what really matters: temperature or sea level rise. That we are in a temperature peak that I believe to be mostly natural makes loss of loss from tiny glaciers that lack thermal inertia in extremely cold locations in isolated climate zones does not impress me as much as the idea that world sea ice is starting to melt in an actually meaningful manner. That the IPCC claimed the Himalayas would melt by 2035 means that unless those who allowed such a claim to pass through their peer review process need to go or I have little trust in current claims of impending doom. But boy oh boy look at the extreme *cooling* in Antarctica where 90% of world ice is contained! [DB] Nice Gish Gallop. This thread is on 'Are glaciers growing or retreating? '; please stay on-topic to ensure your comments do not get deleted. For the casual reader, appinsys is well-known to be a site of active disinformation on matters related to climate and climate change. The other graphics that Nik provides to further his narrative are of unknown provenance and should be regarded as questionable. A reliance on primary sources is best. NikFromNYC @16, I am unsure what point there is to your post other than to sow confusion. The topic of the main article above is the ongoing retreat of glaciers world wide, something you do not dispute. You do attribute the retreat of Himalayan glaciers to black carbon (soot) from the Indian industrialisation, and indeed that is probably a factor; but it is hard to dispute that they would continue melting in a warming world, even in the absence of black carbon. More importantly, the ongoing retreat of Andean, African, North American and New Zealand glaciers shows the primary cause of retreat is a global factor, specifically the rise in temperatures through the 20th century. The map on the left is from O'Donnell et al, a team closely associated with Climate Audit, and one of the very few pieces of actual science produced by people associated with Climate Audit. It is not without its problems, including a number of methodological choices that introduce a cooling bias to their study, but even so it shows a clearly warming Antarctica with some cooling regions. You also mention the IPCC's error with regard the Himalayan glaciers. The incorrect prediction of glacial melts was made by the IPCC Working Group 2, which looks at the impacts of global warming, not the science of global warming. It therefore is no reason to call into question the very high standard of the IPCC Working group 1 reports. What is more, it is just one error from among tens of thousands of factual claims across 3000 pages of the IPCC report. An error rate of less than 1 in 10,000 is no reason to doubt the general reliability of the IPCC. In contrast, many of the more highly touted denier documents struggle to keep their error rate down to 1 per sentence. Having said that, may I suggest you take comment about that error to the appropriate topic (which I suggest you read). NikFromNYC, you need to look at the story closer. As I recall, the 2035 claim was discussed on this site. The search engine works well. It turned out to be another molehill made into a mountain through the usual disingenuous methods. Tom addressed the Antarctic cooling canard. Overall, your post adds little that is of value for one seeking good information. Your claim that the Himalayan temperature increase is due to land use changes is not only unsubstantiated but unplausible considering how much is actually there to use and how long it has been used in one way or another. It's not like forests are being cut down on the icy slopes. As for what is useable, it is scarce and has been used by the locals for a very long time. Ramanathan has shown that, at the altitudes where the brown cloud aerosols are found, they exert a strong positive radiativce forcing. This forcing is a much better candidate for the temperature increase than your land use hypothesis. The glaciers get a double whammy from the black carbon deposited on their surface and the atmsopheric BC heating them up. I’ve come across an interesting easy to read general paper on AGW by the glaciologist Lonnie Thompson titled Climate Change: The Evidence and Our Options. muoncounter:The finding of the ice mummy, Otzi, does this indicate the present melting of the glaciers are now back to the level where they were when this mummy was first frozen? So, this would represent natural climate variability. oneiota: Glaciers may or may not be a good indicator of climate change. Uniform melting of mountain glaciers, excluding Greenland and Antarctica, is an indicator. About 65% of all mountain glacial ice worldwide as noted above, is found in Canada. So, if Canadian glaciers are all melting, in unison,then, yes, a good indicator of global warming. It is my understanding that Mt Kilimanjaro's source of moisture for glacier building was a forest at its base, which had been cut down, so the glacier disappeared. Many glaciers have sublimated even when the temperature above the glacier was still below freezing. Can someone vouch for the temps over each of these declining glaciers? That data appears missing? So, the many causes for glacial decline are not even mentioned. Henry justice @20, you are assuming that Otzi died in an ice free area that later became glaciated. That would be near impossible, and is contrary to the evidence. Rather, he died above the permanent snowline, and has remained above the permanent snowline ever since. "Many glaciers have sublimated even when the temperature above the glacier was still below freezing"
Now why do you think this is? You seem to be trying to say that glacier melting isn't a sign of temperature warmings, but actually temperature rise is symptom of increased surface radiation. Might not that have something to do with the ice melt. Tom Curtis: Antarctic warming- Could some erupting undersea volcanoes in the warming areas of West Antarctica be the cause of the warming there? [DB] There simply is no evidence to support that assertion. And much to the contrary (example here). scaddenp: Thanks for your comment and reference. I believe action was taken to replant the forest. Sadly, it may prove very true that it will not do the trick. Sublimation may indicate a change in atmospheric air streams to a drier air. Glacier melting from increased warming via conduction is certainly a factor, not necessarily air temps increases. For the last 200 yrs the slight upward temp trend has been declared at about +0.5 deg C. Increase in IR (i.e.8-15 microns) will cause 10 deg F insol (Bragg Equation foldback effect) and yes, that will cause melting. But that is for snout ice, not hard ice underneath the glacier, which might be at a much lower temperatue. So, what are we talking about for all these melting glaciers, softer snout ice or hard glacial ice? [DB] I disagree, there is an active under the ice volcano in the area where the warming is graphically shown. Your reference did not address Antarctic underice/sea volcanoes. [DB] "there is an active under the ice volcano in the area where the warming is graphically shown"
Citation, please? Also please quantify how much heat is melting how much ice causing how much warming. Please include in your citation the paper the peer-reviewed study you cite appeared in. "Your reference did not address Antarctic underice/sea volcanoes"
Quite frankly, it doesn't need to. Volcanoes are not magical creations possessing the higher intellects needed to discern between hemispheres, like say, polar bears and penguins. [Not DB] In my opinion, volcanoes are not really on topic for this post, which focused on the plain and simple fact that glaciers overall are not growing. Evidence for and against that particular point is welcome. "Sublimation may indicate a change in atmospheric air streams to a drier air. Glacier melting from increased warming via conduction is certainly a factor, not necessarily air temps increases." And the evidence for this what? And where is the extra heat from conduction coming from? Almost of all of glacier melt is in the ablation zone, and in many cases, ice loss is accelerated by calving. As to the sudden appearance of volcanoes causing melting where it wasnt before, leaving aside the question that heat flow from volcanoes is very localised, in what ways would such melting be different than that caused by warming? And how does that compare with observation? Henry Justice @26, you continue to make a string of claims with no attempt to either justify, reference or defend them. That is called trolling. Forum rules forbid me from saying what I think of trolls. Take your claim about about Arctic volcanoes. A troll says "arctic volcanoes" ergo heat from volcanoes is melting the ice. Somebody with intellectual integrity, in contrast, would seek to answer several questions. a) The volcanoes are newly discovered, but are they newly existing? If they are not new volcanoes, then their presence is not a change to the Arctic heat budget and therefore cannot explain changes in Arctic ice extent. b) Can the heat from the volcanoes reach the surface? The answer here is not obvious. The Arctic is the location of a strong down welling current as part of the thermo-haline circulation. 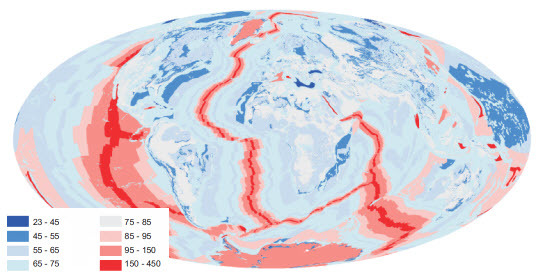 Therefore heat from subsurface volcanoes in that region are likely to be carried in the subsurface current into the depths of the Atlantic, and hence to the Antarctic rather than to simply be carried to the surface. c) Can the volcanoes significantly effect the surface temperature? There is a lot of water between the volcanoes and the surface, and water can absorb a lot of heat. To raise the temperature of surface water significantly, the volcanoes must raise the temperature of the entire water column. It is very unlikely that they have enough heat to do so. d) Do the volcanoes have enough heat to melt the ice? That means there would need to be 2.35 million square kilometers of these under sea volcanoes to melt the ice. So are there? Have they found 2.35 million square kilometers of previously non-existing under sea volcanoes in the Arctic? Or is this just another trolling drive by. Trolling only works because the troll needs make no intellectual effort, while the rebuttal of the trolling does! I don't like that ratio, so if you are not a troll, you need to answer all four of my questions above, with linked or properly cited sources, and with the steps of your arguments clearly laid out. If you are not prepared to do so, then you clearly are a troll, which is sufficient rebuttal of any point you pretend to make. Trolls have no intellectual integrity - they have put no effort into forming their "opinions". Therefore they need be given no intellectual credence. Over to you. Response: I've deleted Henry Justice's comment you are responding to, because not only was it trolling, it was not really on topic. Sorry, I forgot to properly explain the map in my previous post. It is the map of the geothermal energy (including from volcanoes) of various part of the Earth. The units are mW/m^2, so need to be divided by a thousand to show values of Watts per meter squared. would you please delete comments 26, 28, 29 and 30 in their entirety. Especially comment 30, since I see no mention of anything about the Arctic. Tom Curtis at 22: "you are assuming that Otzi died in an ice free area that later became glaciated." Here is what I stated: "Does this indicate the present melting of the glaciers are now back to the level where they were when this mummy was first frozen?" This does not state or indicate an ice free area! Finally, here is a reference for a good discussion on melting glaciers: Behavior of World's Glaciers Fails to Prove Global Warming Theory by John Carlisle, Feb 1999. Response: [DB] Please note that volcano's have been determined to be off-topic on this thread. Henry, don't you think the title of Carlisle's work is a little, well, ignorant? Decline in glacial mass is not cited as evidence for the theory of AGW. No scientist would say, "glacial mass is declining and this proves AGW." Carlisle: "Glaciers are influenced by a variety of local and regional natural phenomena that scientists do not fully comprehend. Besides temperature changes, glaciers also respond to changes in the amount and type of precipitation, changes in sea level and changes in ocean circulation patterns. As a result, glaciers do not necessarily advance during colder weather and retreat during warmer weather." What a revelation. Glaciers "do not necessarily" shrink or grow in response to changes in global temp, but in general they do, as evidenced by the change in global mass balance. The analogous situation is global sea ice. Area of both poles are subject to regional fluctuations from year to year, but Arctic extent, area, and volume are, across the entire Arctic region, rapidly decreasing. Antarctic sea ice extent is slightly increasing, even while ice shelves show signs of increasing deterioration. Henry, you surely arent mistaking articles by right-wing think tanks for science? Looking at published science we note for instance here, we find temperature is the predominant influence. Modelling on the franz joseph when advancing showed it needed a 40% increase in precipitation to offset a 1 degree increase temperature at the terminus. The worldwide glacial retreat is consistent with established climate theory. All of us want to find evidence that supports what we would like to be true. The development of science has showed that we need find a discipline that protects us from this normal human reaction. Try thinking about what evidence would convince that your views are wrong and see if there is evidence to support this. Look for that evidence in peer-reviewed science publications. There is plenty of fairy-dust about on the net for those just want to be fooled. DSL at 33: Yes, I do agree. However, come lately, the glaciers, via mass balance analysis, are disappearing at an alarming rate due to increasing air temps, lack of snow and shifting jet streams. Water supplies are adversely affected. While in Arequipa, Peru, I watched the 19,100 ft snow cap disappear. Water is a big problem down there and elsewhere. The mass balance analysis is now supporting the retreat of the glaciers. This is so bad in Peru that they are painting the rocks white. scaddenp at 34: Thanks, you have restored my confidence. Yes, I seem to remember that. But I thought that the terminus ice not being compacted melts much faster. My take on glaciers is that of a hard tongue of ice where temperatures may be 50-80 or more degrees F below freezing: i.e. Greenland and Antarctica, the bulk of the world's frozen water. The temps, density and melt rate of snout ice glaciers are all different. Rapid retreat is expected in "shallow iced" glacial areas (i.e.compared to Greenland or Antart.) So, yes, climate is changing for now and the glaciers clearly indicate this. But will this trend last into the upcoming decades? Anyway, I will make an effort to shake off the fairy dust. Thanks. In the very few places in the world where glaciers are advancing (or have some oscillation), then for most it is due to more precipitation in the neve overwhelming the increasing temperatures at the terminus (which by definition is where temperatures are too hot for ice to persist unless its terminating into water). The ones I know about are in NZ Alps and southern Andes where warmer oceans are increasing precipitation from westerlies blowing onto the mountains. With precipitation, temperature and flow rate monitored, you can model the effects of changing terminus temperature and changing snowfall. Will it last? Will if the amount of radiation warming the surface increases, then yes it will. With increasing GHG concentrations, then that is a measurable increase. For it not to continue in face of increasing emissions, then you must have either less sunlight entering or more sunlight reflected (higher albedo or more aerosols). The sun going into really deep minimum would cive us a reprieve but if we didnt use that time to reduce GHG concentrations, then we would suffer badly when the minimum was over. Hi, I have an honest question. I read an article here: climate-skeptic.com that basically claims that glacial melting history is being cherry picked by climate change theory advocates and ignores that glaciers have been melting for 200 years, since before the onset of CO2 emissions. I dismiss most denialist stuff, but haven't seen any rebuttals to this argument. Is this just a new argument? What's going on ? Thanks! Chef, what evidence was given for the claim? Some glaciers have cycled through gain and loss over the course of the current interglacial, but most of the world's ice hasn't been monitored until fairly recently. To use those few glaciers that have 200-year old records to make a claim about global ice mass loss--that's a cherry pick itself. The sharp reduction in global ice mass over the last 30 years is well-documented. Not all glaciers are retreating. The overwhelming majority are--Antarctica most alarmingly. Interestingly, increased atmospheric water vapor should mean more available snow, and thus an increase in glacial mass. Nope. Too warm. As a proxy for AGW, it's pretty good. After all, what could be causing this ice loss? It's not increased insolation, because there hasn't been increased insolation. It's not volcanic activity under the ice, because that's not happening either. Further, whatever alternative theory that might be proposed for such loss, it would still have to take into account increased global energy storage via increased CO2. If it were discovered that black carbon was the culprit, that wouldn't suddenly negate the known physics of atmospheric CO2. Oh, and Chef, did you click on the "intermediate" tab above? That has information on the number of glaciers monitored -- directly relevant to the cherry-pick claim. wealthychef @41, figure 1 in the basic article represents a full rebutal of the fake skeptic claims. If you look at it, you will see a gradual loss of glacial ice from 1850, which represents the ongoing glacial retreat for some glaciers since the little ice age. However, two features stand out. First is the much more rapid loss of ice since 1970. If glacial ice loss simply represented the restoration of equilibrium after the LIA, glacial ice loss would gradually slow as it approached that equilibrium. Hence, the recent very rapid ice loss shows clearly that the cause is a recent warming rather than the warming that accompanied the end of the LIA. 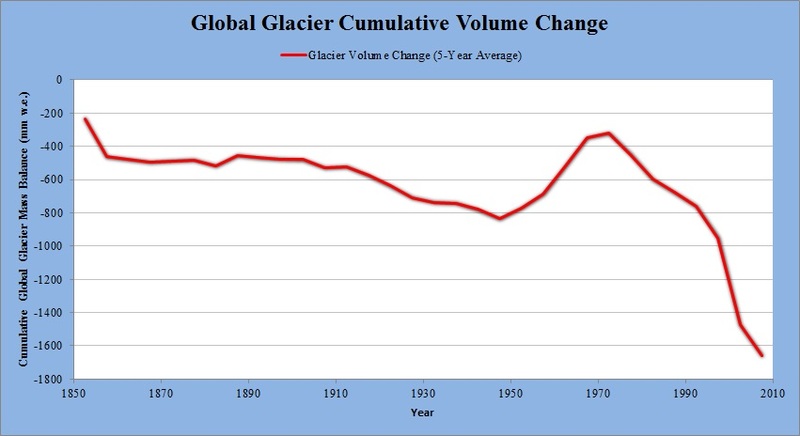 Second is the brief accumulation of glacial ice from 1950-1970. Global temperatures actually cooled slightly during that interval, primarily due to the rapid accumulation of sulphate (SO4) in the atmosphere from the burning of coal. The important factor here, however, is that that brief cooling could not have resulted in an overall gain in glacial ice unless the glacial ice was very close to equilibrium. That gain in glacial ice therefore contradicts the fundamental assumption of the fake skeptic argument, which is that glacial ice balance is far from equilibrium, and continues to be lost because of a warming episode that ended over a century ago. Typical of fake skeptic arguments, the argument presented at climate-skeptic.com is depends on superficial knowledge of the data to retain its plausibility. Ok, so what if I were to say the rapid decline(rate of change) after 1990 was also seen at the start of the graph in figure1(Basic). Does the graph in figure1 actually make any statment keeping this in mind? The mass loss from 1996 to 2005 is more than double the mass loss rate in the previous decade of 1986 to 1995 and over four times the mass loss rate over 1976 to 1985. A regular doubling period is the exact definition for exponentiality... can anyone please tell me when the saviour of sinusoidality kicks in?? Aerosols were likely the biggest contributor to glacial retreat in Europe from 1850 to 1910. Aerosol loading in the Himalayas due to Indian, European and African fossil fuel consumption are likely the largest contributors to glacial retreat in the Himalayas. There are uncertainties if aerosols from China make their way into the Himalayas. Aerosols reduce albedo and increase the skin temperature. This same effect, surface darkening effect (SDE), is also leading to a reduction in boreal forest snowpack accumulation (video). It is also having an effect on the Sierra Nevadas in California. The Himalayas is the largest reserve of ice outside of the polar regions. Anthropogenic aerosol forcing is largest contributor to this glacial retreat – not anthropogenic GHG forcing. There are many uncertainties regarding the role of aerosols in global warming; it is also the largest source of uncertainty regarding anthropogenic radiative forcing (IPCC chart).